Santa’s making his list and checking it twice, while on Okinawa the holiday spirit is beginning to catch fire with plans for spectacular lights displays and shows. From northern Okinawa to the far south, cities and businesses are making final adjustments to holiday extravaganza’s to begin little more than a week from now. There’s something for everyone, and countless opportunities for shutterbugs to capture memorable photographs. Lights will be illuminated daily from 6 p.m. ~ 10 p.m. through January 3rd. Admission Fee to the 10th Itoman Peaceful Illumination Festival is ¥200. Prayers take place each evening at 8 p.m. as the festival conducts a ‘starlight wink’ where all illumination is turned off once, then lit back again. More than 120,000 visitors are expected during the 15-day run. 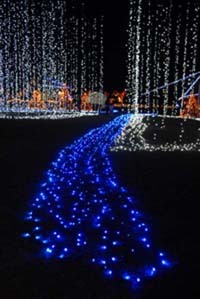 Southeast Botanical Gardens in Okinawa City sets its grounds aglow with tens of thousands of lights on December 23rd. Christmas paradise 2008 takes visitors to a heart warming world of magic, with colorfully decorated palm trees, banyan trees, hibiscus, bougainvillea and other plants and flowers carefully decorated with colorful lights. Southeast Botanical Gardens will stage an all-original show the 23rd through 28th with lazer lights, sound and fireworks. Advance tickets for adults and youth over 12 are ¥1,800, or ¥2,000 at the gate. Child tickets for those 6-11 are ¥900 in advance or ¥1,000 at the gate. Children five and under are free. Christmas Fantasy springs to live again at Okinawa City’s Zoo Park, a holiday special event bringing smiles to adults and children alike. It’s the only place on Okinawa where visitors get to play with snow…really real snow…snowballs…a slide and more. Advance tickets are now on sale at Kadena ITT and MCCS Tours. Adult advance tickets are ¥1,700 and child tickets for those age 4 through junior high school are ¥1,000. Christmas Fantasy opens December 23rd and runs through the 28th. Drives around the island will reveal dozens of businesses who’ve lit up their properties for the holiday season, and hotels are turning up the lights, too. Kanucha Bay Hotel and Villas’ holiday display is worth the drive up Highway 58 to the north. The hotel complex has a giant 12-meter Christmas tree, plus an outdoor display of more than 100,000 colorful lights. Renaissance Resort Hotel Okinawa, not to be outdone, plans a 15-meter tall tree. The general public is invited to visit and view the illuminations throughout the holidays. Even as the Itoman Peaceful Illumination is set to begin, plans are being finalized for the 31st Mabuni Fire & Bell Observance New Year’s Eve into New Year’s Day. The ceremonial festival takes place at Okinawa Peace Memorial Hall, which also stands in Mabuni, with prayers being offered to the 230,000 who died during the Battle of Okinawa. Just before the new year arrives, moments before the stroke of midnight, the flame of prayer will descend from the 45-meter-high bell tower to light participants’ torches as they welcome in the new year. As a choir sings, the Bell of Peace is rung as participants light the large flame holder with their torches. It’s a solemn, chilling festival that’s not to be missed.